Although I am a rampant devotee of library books, there are a few that I need to own. To keep on my bedside table and refer to on a regular basis, jot notes in and then carry around in my bag without worrying that I’ll muss it up. 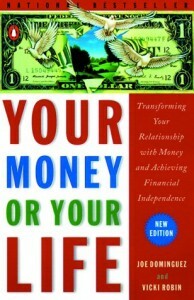 “Your Money or Your Life” by Joe Dominguez and Vicky Robin is one of those books. This book is not about how to get rich or clip coupons. It’s one of those fantastic books that take a broad look at how money, personal energy and life all combine together. I ♥ it! I haven’t actually done a front to back read of this book in a few years, but I am going to reread it this week, so I can share my favorite bits with you. To enter to win, write something in the comments section about your own relationship with money. One entry per person, U.S. residents only. I will randomly choose a winner midnight of Saturday, July 10th Pacific time zone. For us it is pretty much a love/hate relationship. We love to spend it, and it hates coming back to us. My relationship with money is relatively sane, it’s time and obligations that I need to balance. My relationship with money is supportive. I have never wanted to do something and not had the money to do it. But I have also worked many jobs and tried to keep day-to-day spending in check so I do have options to follow my dreams. As I get a little older, I am learning that planning and deferring can be as satisfying as jumping right in to new life endeavors. That said, I have made big mistakes with money and all stem from my emotional needs. But some of the “mistakes” got me to where I am today so I can’t be too down on them. Lastly, I am newly learning how to save money at the grocery and drugstore with careful shopping/coupons/discounts and am finding this to be a very healthy venture. I used to just go to the grocery and buy whatever I wanted. I figured that since I wasn’t buying meat-taking taxis-buying frozen dinners-getting takeout all the time-running up bar tabs all over town-buying new clothes at full retail price-etc., that meant that I was frugal enough in most aspects of life that it didn’t matter what I bought at the grocery store. Having changed my mentality to the system advocated by many frugal bloggers (weekly meal planning that focuses on food that is on sale at the store that week + coupons + no food waste), I am having so much more fun feeling in control and mindful! I am loving it. As Katie writes about, there is money and resources to be “found” everywhere if you put attention to it, and it’s a lot more fun than regular old working and regular old shopping if you know what I mean! My relationship with money is about balance, having enough for the bills and experiences. Hmm…money…it’s nice to have enough, but not too much (not that I would know), but still pretend you don’t really need/want/or care about it. I recently went from working part-time to full-time and haven’t yet gotten used to having all this extra cash to throw around. I’m expecting my first child in a month and my husband and I will need to adjust our budget to reflect our new priorities. It’s a constant struggle for us to be on the same page with our money, so maybe this book would help us get there! if you had a spearate account for you have and spend, would that help? The idea is to put the rest of it off-limits. I can be a control freak with money: making it and spending it. I wish I had a more holistic approach like it sounds like this book offers. I haven’t always had a good relationship with money and I’m dealing with that now. But recently I’ve always seemed to have just enough to get my bills paid and start paying off debt. But for some reason whenever I have extra money, I feel the need to spend it. Odd, because in my Bible reading this morning I was in a section where Jesus talked a great deal about money. I TRY to be wise in my money, since I am only the steward of it and of my possessions after all. I don’t completely have a handle on this yet but my goals are to be careful, to be wise and still, to be generous. I am not impressed by the miser, the hoarder. I had rather be a person who readily gives than one who keeps for one’s own pleasures. Having said that, I still find myself sometimes fearful of the future and wishing I could both have and be generous at once. This is my own struggle and is one I may never completely resolve. Money is frustrating at times….if u have extra it calls to u and says “yes yes yes u can” when there isn’t any you feel low and almost shameful- even if your bills are paid- like telling friends “no i can not go out to eat I have already spent all my fun money this month”. I am working very hard along with my husband to make “responsible” money decisions. We are 27 and in the process of buying our first house, my parents gave us some money to help and we are really struggling with using it to make the house pretty or paying off more debt…. I have a pretty good relationship with money. My biggest complaint right now is that my job will be ending soon, and I need to find a new one. I’ve only been in the work force for 1 year on a very small salary, so I do not have much in savings to tide me over if I am unemployed for more than a few months. This makes me nervous, but at least I knew to save some of my money! I am nervous about money. I feel like I am overwhelmed with things at the moment. I am in a one income family due to a health issue on my part. we watch each penny we spend. I was typing a response about how healthy my relationship with money was — how responsible we’re being, how much joy I get from my various frugalities or expenditures– but everything I was saying made me realize how unhealthy it possibly is. I realized that I think about money almost all the time, not in that I want or need more of it (except who doesn’t), but more in an OCD, calorie-counting kind of way. I check the balance of my student loan multiple times a week, even though I only pay on it once a month. I have taken on The Compact, and I love nothing more than to calculate to the penny how much money I’ve saved over my retail spending in the same time period last year. I look at our monthly grocery budget and calculate to the dollar what each meal is costing us. I feel guilt about every spent penny that *might* not have been necessary, even when I need or enjoy the things those pennies buy. I’ve always considered myself frugal, but maybe this obsession with paying less and getting the most is actually taking up valuable brain-space that should go to…oh, anything else! Naturally, it’s better to be “good with money,” but at what point have I potentially gone too far? That’s something for me to chew on today. I have an odd relationship with money. up until 5 years ago we were happily in a 6 figure income marriage…then my hubby quit his job (a wise decision – he’s healthier now than he was) but our income took a major hit. we now make less than 48% from 5 yrs ago but hubby was just laid off; my job has been eliminated and I am currently covering for someone on disability. There is a good chance I will be laid off at the end of August. (But will get roughly 6 mos severance). Our furnace/central air is 36 years old and really should be replaced, we haven’t had a vacation in 4 years, our in laws are planning a disney trip this year to celebrate the p’s 50th anniv and we can’t afford to go. a decision my son understands, but feels very left out. I am happy that we are frugal, have a small mortgage payment, have food on the table and a garden out back and a little debt we are working hard to pay off. (it’s less than 2grand). I know this book would help us and I could pass it along to my brother after I read it. (he was just laid off also and my SIL had a stroke a few years ago). I read “Your Money or Your Life” years ago but I need to read it again, it would be great to have a copy. My relationship with money isn’t the problem, I can save with the best of them. The problem is when love gets in the middle of me and my money, then I’m a poor soul. My relationship with money is love hate. Having money increases the siren song of MORE STUFF. On the other hand, not enough money puts me into full on panic/survival/hoarder mode. There’s got to be a happy medium. I love this book! It’s been regular reading all year as I’m taking control of our finances and ought to be required reading for everyone! This sounds like a good book to have… My relationship with money is a love and hate relationship. I love handling money, saving up for certain funds (such a new car), setting up budget, etc. & etc. At the same time, I hate being disciplined to keep on top of the budget and our expenditures. I too missed the open-ended variety of what you write about during the month of June and the food stamp experiment. But I think it worthwhile that you took the energy to test out whether you could come in under the magic number for a family of 4. I suspect that were I on food stamps I would have been a more avid reader, saying “Finally, a sympathetic voice.” But now it’s a new month and onward. Money for me means security. I feel like I can’t pile up enough and I constantly worry that I am one illness or catastrophe away from ruin. I think this has a lot to do with my childhood, because we didn’t have much money and it made for a lot of tough times. I am trying to work on worrying less and enjoying life more. Gaining control of my money, my attitude and my weight has revolutionized my life. I’ve never been healthier or happier, but I know I have to work to stay where I am and to reach where (and who) I want to be. Books like this, shows like Suze Orman and ‘Til Debt Do Us Part…they all help me keep on keepin’ on until I’m DEBT FREE! (I lost 63 lbs so I’m all ‘debt free’ in the weight dept. 🙂 ) The more I find ways to positively interact with my money, paying down debt while still living life, the better I feel. I’m at a place in my life where I’d say my relationship with money is “real”. I can comprehend that we’ve come to rely on it as a form of trade though it does not hold the power and awe that it did when I had not of it. My family lives well and we stay within our means. I continually challenge myself on personal levels to be creative and thrifty. I know that if I really want something that I can work for it and money is often the fastest, slickest way to receive what is needed/desired. That said, I strive to barter/trade as much as I can as the value that I put into any creation, work/job, or experience is often much more than the value of a dollar. For me, money, having it, earning it and making it is secondary to the totality of the experince. In other words, I play the game, when I choose to, yet I know that money is one of the many forms of exchange and connection. My husband has decided to retire at the end of the year due to his health and I feel a little overwhelmed because of our debt. I need all the helpful suggestions I can get. We’re fairly frugal, so my relationship with money is I need more of it. My relationship with money changed forever after I read this book. I’ve given away several copies over the years and I currently have this book listed on my “want” list on swaptree.com. Until I read this book, it honestly never occurred to me that I could live with greater purpose and without debt. Amazing! My relationship with money is an ongoing learning experience. Just when I think have it figured out, something new comes along. Right now I am in the decluttering mode, and I’ve noticed the relationship of decluttering and not spending go hand in hand. Why bring (spend) in new things when I am trying to simplify? So I don’t buy anything (except basics like food) and guess what? I find my savings grows bigger. Isn’t that something???? Right now I am luckily to feel that we have enough money in our lives. (We still watch our spending, of course.) Time feels limited though with a toddler and two full-time (working) parents. This book may help me think about all of this in my life. Thanks for the opportunity to win this book. I’m a neglectful partner in my relationship with money, in that I really don’t think about it all that much. If you’d asked me my weekly salary when I worked, it would have taken me a few moments to remember. I never dwelled on it. Nor did I ever amass debts, then or now. I’m unemployed after being laid off in December, but when I worked, I was content with my modest salary and able to save for the future and purchase the odds and ends/services that make life comfortable. I look at money’s primary role as the purchase of freedom — to eat what you enjoy, vacation where you want, things like that — and not one to fill your life and your house with stuff. My relationship with money is still evolving and everyday I learn something new. I went from having no control over money as it came into and left my life (with more leaving than was coming in! ), to knowing where each dollar that comes my way is going. I still stumble every now and then, but I’m trying hard to learn how to manage my money without driving myself crazy worrying about it, while still enjoying my life to the fullest. I’m working to redefine that relationship. I want money to be more of the means to the life that I value. I have never thought about this question “What is my relationship with money?” before, but now that I contemplate it, I realize that I have evolved quite a bit over the years. Recently, my relationship with money has been a love/hate. I love to have it, but hate that I am not able to save as much as I would like. I have cut back drastically and cut out all my shopping trips for useless crap, but I still don’t seem to be where I want to be. I guess I will just keep on trying to do a better job and see where I end up. I want to use money intentionally. If I am frugal about things that don’t matter to me (lots of new clothes, dining out, cable TV, etc.) then I can take the money I’ve saved and use it any way I like. I’m in planning mode with my money right now! I’m budgeting and saving for the goals I want to achieve. Ugh, money and I have a troubled relationship. I always worry that we won’t have enough, and it seems to be only to happy to leave us. I don’t worry about money that much! I also don’t spend that much. Ah…MONEY! 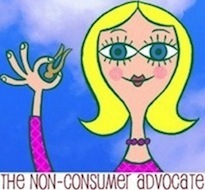 Living a constant struggle between “material girl” and conscientious consumer. If buying less, buying gently used and not buying are the paths to simple living…how do I stay on them? Love the book & would love to have a copy of my own to highlight and remind me of the trade-offs between money & life energy. For us, I budget every month on an Excel spreadsheet but I can’t bring myself to micro-manage/control EVERY penny … so we have the general budget, which shows that we have enough money, but yet, we always blow through our earnings each month. I like money. I think about it a lot so that I don’t have to think about. Big savings account balances make me happy. My relationship with money is that I make it, and my family spends it. I get very frustrated, because to me, treating money disrespectfully is the same thing as treating me disrespectfully — after all, I spend my time at work that I enjoy, although I would frankly rather be retired — to support my family. My needs are quite small. Give me some sunshine, a good book, a roof over my head, & some fresh strawberries, and I’m good to go. I read Your Money or Your Life years ago, and it is a great book. I, however, need a book entitled “Your family’s money, your mom’s life” to have my husband and children read. Money is a very anxiety-producing thing in my life. My parents were constantly worried about money when I was growing up, and so I have a strongly ingrained fear response and lots of insecurities about it. I wish that they could have sheltered me a little bit from that. I still didn’t know how to be sensible about money when I was on my own! I really like hearing about how you work with your sons on money issues — it seems like a very healthy balance of sharing the importance of being moneywise but also that wealth comes in other forms — your health, quality free time, relationships. I think that some kids that grow up in a frugal household could feel deprived or anxious, so that when they are on their own they spend frivolously or recklessly, but I’d bet (though I am not a betting gal!) that your boys will transition into being on their own by continuing many of your frugal beliefs. I grew up (for the most part) in the presence of my grandmother who, bless her heart, honestly believes that shopping (and as an extension, material posessions) are the solution to all of life’s problems. Sick? Homesick? Celebrating something? Only own 11 pairs of shoes? Have clothes hanging in your closet that are perfectly good (but older than 6-8 months)? Bored? Going out of your mind because you’ve been home for 5 whole days? Let’s go shopping!!! Now I’m trying to un-learn Grandma’s lessons in bought happiness and self-worth. My relationship with money is one of annoyance. Sure, I’ve got it, but I hate having to think about it all the time. Money provides for a life of financial peace ~ a roof, food and the basics are all that are truly needed. But I also have to add ~ managing and protecting it is a full time job. Hubby & I have always been fairly good with money, because we have never had large incomes and came from families who had modest incomes and were somewhat frugal. However we did put our toes out into the mainstream current craziness of credit cards and borrowing for stupid things like mattresses. But last year we took Dave Ramsey’s FPU and it really woke us up. No, we weren’t as bad off as the normal American, and we decided didn’t want to be “normal” anymore. Since last spring we have paid off what little credit card debt we had, school loans (10 years later) and our daughter’s emergency surgery bill. (About $20,000 in a year!!) And now have almost completed our3-6 mo. emergency fund. Debt free is a great feeling!! Looking back over the years, I realize that though money does provide a feeling of security & peace of mind, I can think of no specific material item that I ever purchased that actually made my life complete or fulfilled. Alternatively, I can think of many people and experiences which give me feelings of fulfillment and genuine happiness. I value money & am mindful of it’s worth, but it’s those experiences and people that are priceless to me. When I’m old and failing, I doubt I’ll remember the earrings or dvd player. The memories of the people I’ve loved and my life’s experiences, however, will fill my heart with contentment. I have to be honest – I have a terrible relationship with money. If I have it – I spend it. I am out of “bad” debt (credit cards), I own my car free and clear but I’m trying to rally my focus to paying off my college loans – so I have good things going, I just struggle with spending money. Reading YMOYL several years ago changed my relationship with money forever! Though not seriously in debt, I nevertheless subscribed to the notion that more was somehow better –so the more we made, the more we were able to have. What the book did was give me a new measuring stick to use to determine wether the value of an item or experience held up to the work time that I was trading it for (which it often didn’t). Over time we have eliminated ALL debt, including our home mortgage, allowing us to live more purposeful and less stressful lives that include only working part time or in some cases part year. I would love to win the newer edition of the book, to both reafirm the tried and true principles and also to see what the thoughts are in today’s economy for how to handle investments. For some reason, I have never had a budget, never felt I needed one. My relationship with money is “platonic” I suppose. I don’t overspend and I save enough each month to not worry about paying for emergencies. I think I have a fairly healthy relationship with money. I am a saver and DH is a spender, though not a spender to the extreme. We keep a tight rein on our money and we are cognizant of what is going and where but we don’t obsess over it. I do love to make a game of finding deals & trying new recipes so I can feed my family well but pretty cheaply. Money is freeing in that it gives you more choices in your life when you have it. But having money is an added responsibility in your life. I guess we both have a respect for the power of money…it’s like the force in Star Wars. You need to be in awe of it’s power and use it wisely for good. Would love a chance to be better about money now that we are down to one income and we have two kids — one is just two weeks old!!! I like to stockpile / hoard money. It makes me feel safer in this insecure world that I have money in the bank if I need it. For any time that I need it. That said, I’m constantly trying to find a balance between money and time. I don’t want to spend all my *time* being thrifty, as it often takes longer (doing things myself rather than hiring someone to do it). Time is at a premium in my busy life, and sometimes it’s easier to throw money at a problem rather than spend the time. Recently, our situation has improved since I returned to work full-time . We tried managing on one income for a little over a year, so that I could stay at home with our daughter, but we accumulated tremendous debt.